Mykonos. 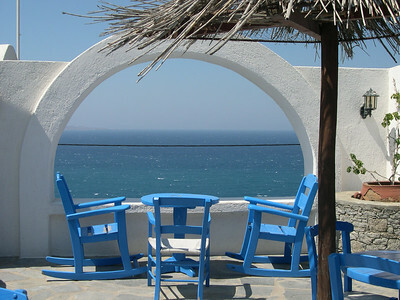 We absolutely loved the Hotel Aegean in the Tago district just outside the main port of Mykonos Town. 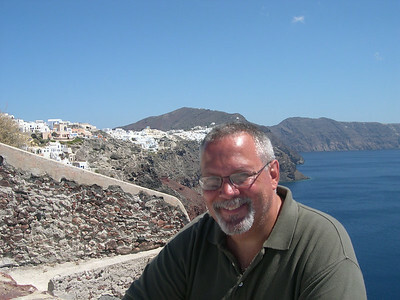 It was on the hillside overlooking the harbor, about 15 minutes' walk from town and away from the crowds and noise. Poolside on an absolutely beautiful day (does it ever rain here?) at the Hotel Aegean in Mykonos. 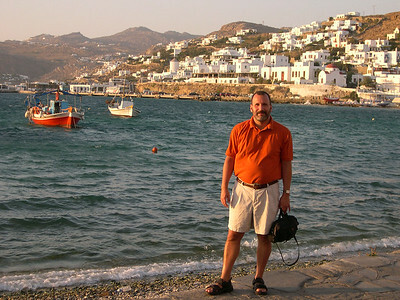 Joe, harborfront in Mykonos Town around sunset. The Tago district (where our hotel is) is on the hillside directly behind him. The view from our room at the Hotel Aegean in Mykonos. 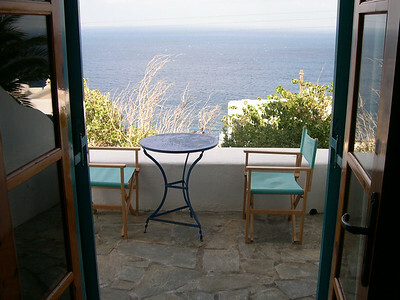 We had a private balcony with a small table and chairs, overlooking the Aegean Sea. Heaven! 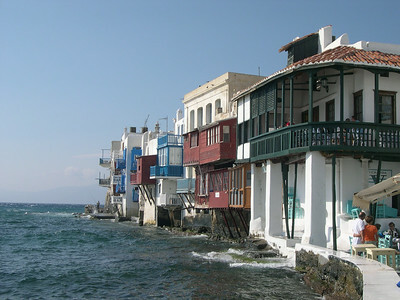 Mykonos. 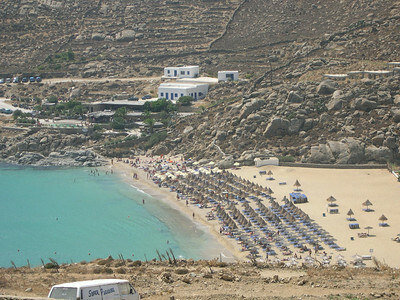 The famous Super Paradise Beach on the southern side of the island. We took a very crowded bus from town to Paradise, then a small boat for about 20 minutes to the secluded cove that is Super Paradise Beach. Mykonos. Super Paradise Beach. The small boats carry people back and forth from the cove throughout the day. 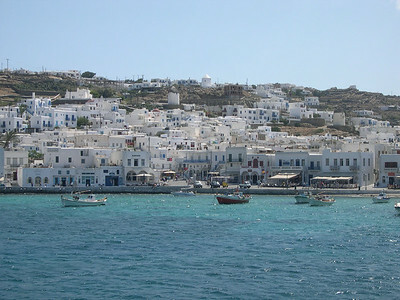 Mykonos Town is characterized by the traditional Cycladic architecture, primarily white and blue paint, and the crowded narrow streets filled with shops, galleries, restaurants and apartments. 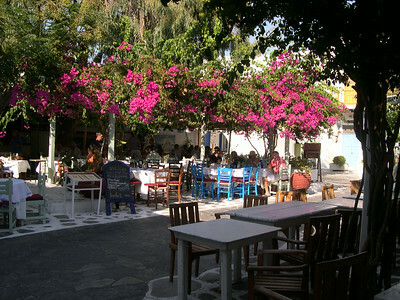 An outdoor restaurant in Mykonos Town. 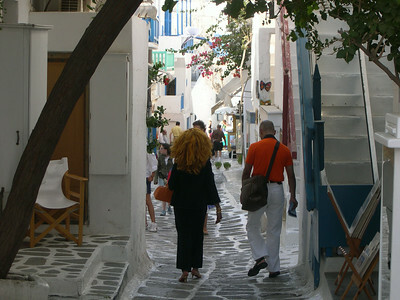 The Little Venice section of Mykonos Town. 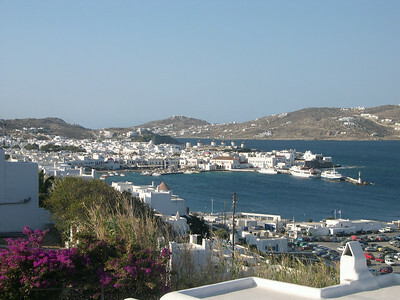 The main port of Mykonos Town on the island of Mykonos. 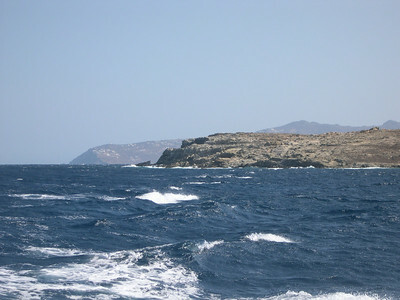 This is part of the Upper Cyclades in the Greek Islands. 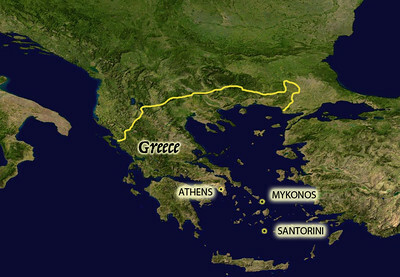 Mykonos. 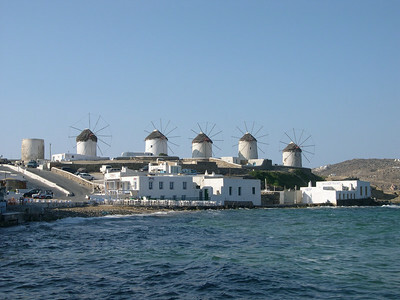 The famous windmills on the hill at the mouth of the harbor to Mykonos Town have long been a symbol of the island. 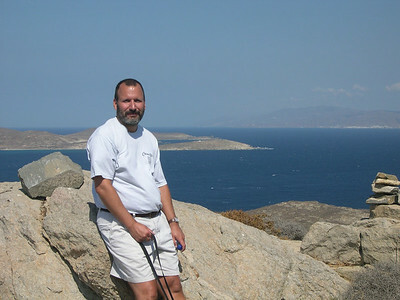 We arranged to take a small boat from Mykonos to the nearby island of Delos (that's Mykonos in the background). Delos is uninhabited, but represents one of the best preserved ruins of ancient Greek civilization from more than 3000 BC. Ed on the island of Delos. 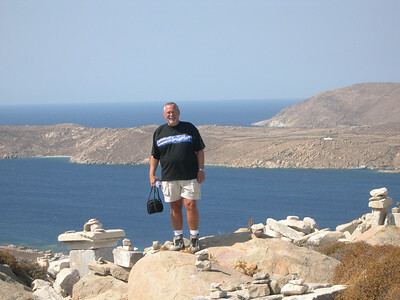 Joe on the island of Delos. 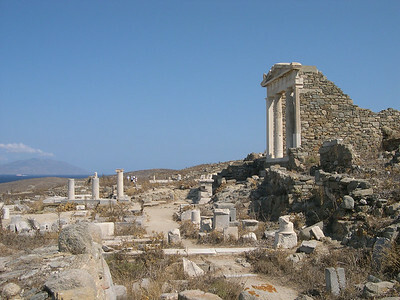 Ruins on the island of Delos. 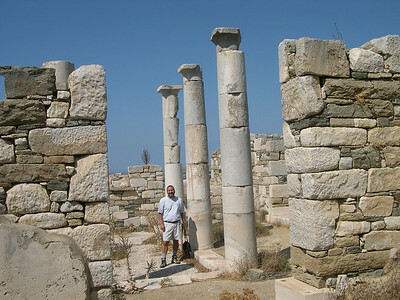 Joe among the ruins of a palace on the island of Delos. 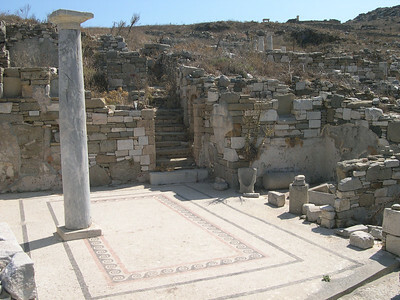 The ruins of a large house on the island of Delos, including a very intricate and well-preseved mosaic tile floor. 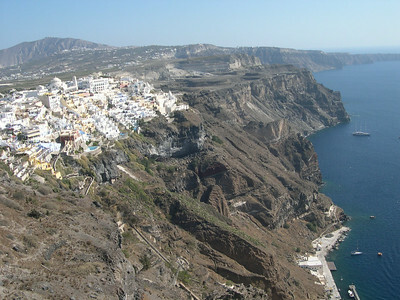 Firastephanie on the island of Santorini is perched approximately 900 feet above the ocean on the edge of the volcano. Views of the town of Firastephanie from our hotel. That's the town of Oia off in the distance, at the other end of the crescent-shaped island of Santorini. Joe enjoying breakfast out by the pool. The views across the caldera and the ocean couldn't have been any more stunning. That's the town of Thirasia on the opposite side of the caldera. 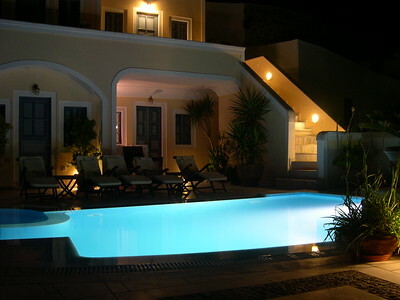 The luxurious Hotel Anteliz in the town of Fira on Santorini. 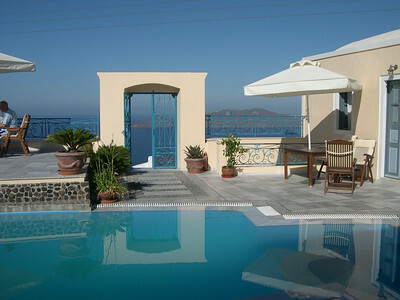 We absolutely loved this place -- only 7 rooms, private and quiet, wonderful pool and breath-taking views of the caldera. Santorini. 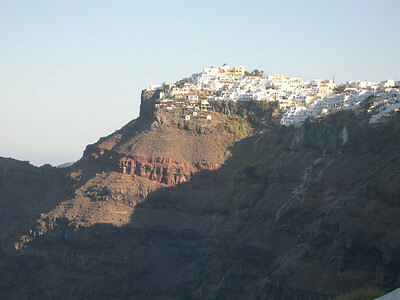 The town of Firastephanie, perched high on the edge of the volcano caldera on the island of Santorini. 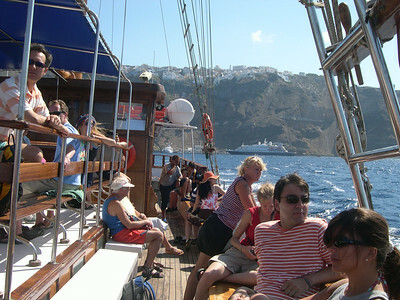 Santorini is the southern most island of the Cyclades. 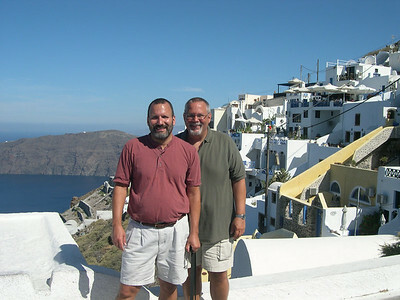 Joe (left) and Ed (right) in Santorini. 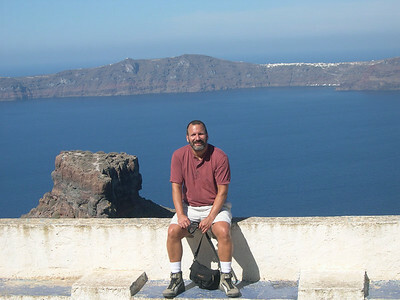 Joe taking a break on our hike from Fira to the town of Oia, approximately 8 miles along the edge of the volcano from our hotel. We made it about halfway before surrendering to the mid-day heat and hitch-hiking back to town to catch a bus. That's the town of Thirasia on the opposite side of the caldera in the background. 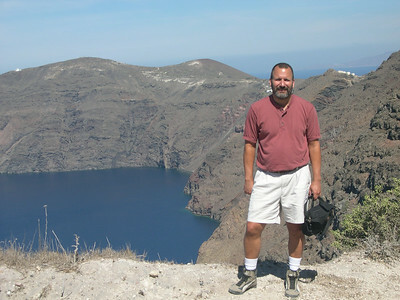 Ed on the path from Thira to Oia. Stunning views of the volcano. You can see the continuation of the trail in the background. 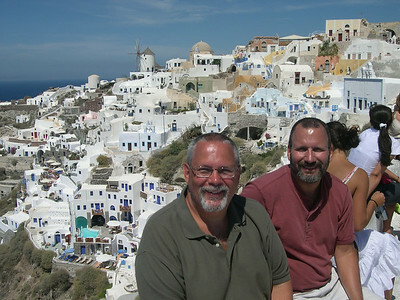 The town of Oia at the tip of the crescent-shaped island of Santorini. We tried hiking the path along the volcano but gave up after about 4 miles in the mid-day heat. 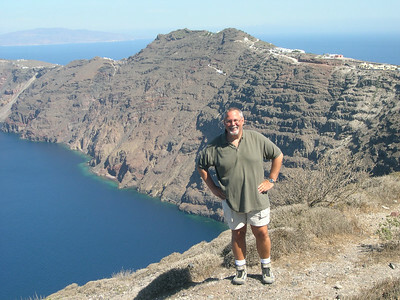 Joe on the hiking trail from Thira to Oia. We gave it our best effort, but the whole 8-mile trek was too much in the mid-day heat. 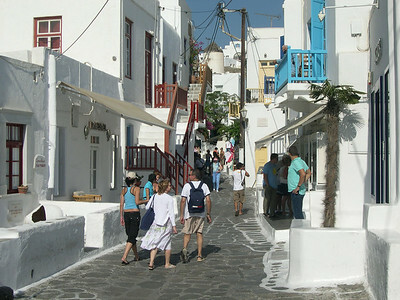 The narrow streets of Oia with shops, galleries, restaurants, hotels and apartments. 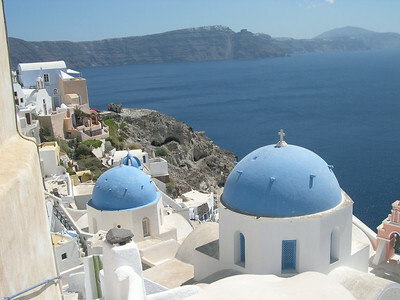 The town of Oia on Santorini with its traditional Cycladic architecture of blue-domed churches. 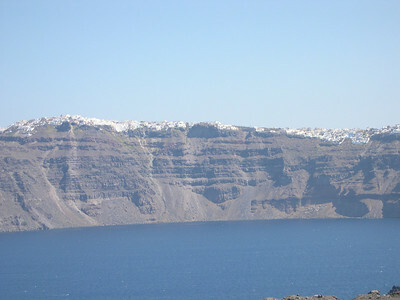 Firastephanie and Thira are in the far distance on the other side of the caldera. 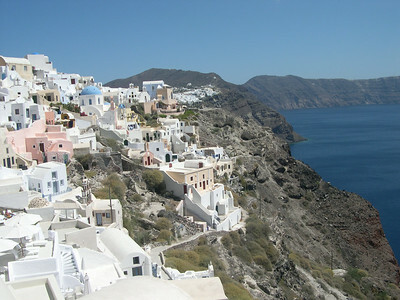 The beautiful town of Oia with its traditional Cycladic architecture on the tip of the island of Santorini. Looking across the caldera, you can see the edge of Firastephanie in the far distance. Oia, Santorini. Ed (left) and Joe (right) taking a break. 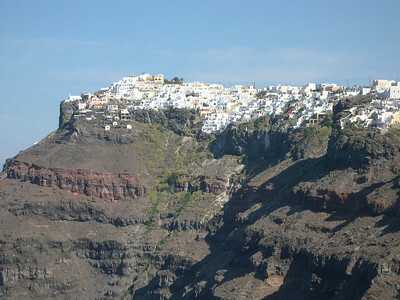 The main town of Thira on the island of Santorini. You can see the mule path leading up from the port in the foreground, and the port itself on the right side of the photo. The beautiful Hotel Anteliz in the evening. We took a boat from the port in Santorini out to the island of Nea Kameni, the active volcano that rose up inside the caldera about 500 years ago. Once there, we were free to explore the island on our own. 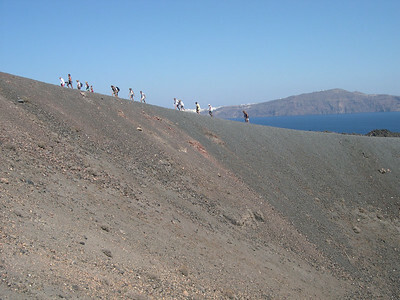 Here we climb the path that leads around the edge of the crater of the Nea Kameni volcano. 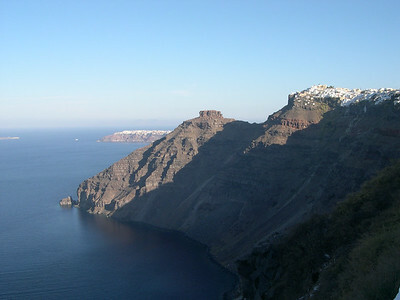 The towns of Thira and Firastephanie can be seen in the background. 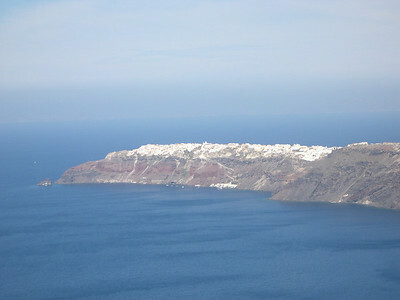 Firastephanie on the left and Thira on the right are visible from the volcanic island of Nea Kameni.